Loory’s collection of wry and witty, dark and perilous contemporary fables is populated by people–and monsters and trees and jocular octopi–who are united by twin motivations: fear and desire. In his singular universe, televisions talk (and sometimes sing), animals live in small apartments where their nephews visit from the sea, and men and women and boys and girls fall down wells and fly through space and find love on Ferris wheels. In a voice full of fable, myth, and dream, Stories for Nighttime and Some for the Day draws us into a world of delightfully wicked recognitions, and introduces us to a writer of uncommon talent and imagination. Why did I read this book: Octopi! UFOs! Bizarre stories that are suited for reading at night or during the day! How could I resist? The woman returns from the store with an armload of books. She reads them quickly, one by one, over the course of the next few weeks. But when she opesn the last one, the woman frowns in surprise. All the pages of the book are blank. As with any collection, certain stories shine more than others and this is certainly true of Mr. Loory’s debut. And yet, none of these stories are bad. As a whole, the collection is both eerie and heartening, strange and lovely. Short fiction – especially of this brevity – is hard to write and can be even more painful to read, but Mr. Loory manages to pare down his stories to those words and phrases at the core of any good tale – adventure, heart, pathos, catharsis. Some stories are bright and some are dark, some have a deeper resonance, some simply are. 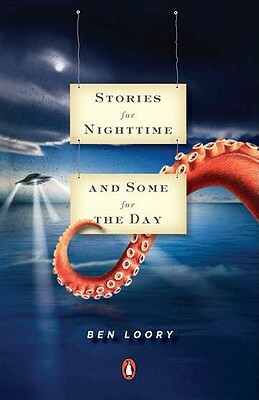 One thing is certain: Stories for Nighttime and Some for the Day is utterly unique, magnificently memorable, and indubitably ineffable. It was a pleasure to travel through the talented Mr. Loory’s imagination, and I am excited to return one day (or night), very soon. Two boys are walking home from school when one of them sees a drainpipe set back in the woods. Look at that, the boy says. I never knew that was there. Let’s go in and see where it goes. But the other boy takes one look at the pipe and quickly shakes his head. Uh-uh, he says. Not me. No way. Why not? says the first boy. Are you scared? I just don’t want to, his friend says, and takes a single step back. Come on, says the first boy. It’s just a pipe. But the other boy won’t be swayed. I’ll see you later, he says. And then he turns around and runs. A man and a woman fall in love and are married, and are happy in every single way. Then one day a flying saucer lands in their backyard, and a door opens, and an alien comes out. I’m going to have to take one of you away, it says. What? say the man and woman. Why? I don’t know, says the alien. That’s just how it is. And in the end, the woman gets taken away. You can read a full story, “The Girl in the Storm” on the author’s website HERE. Thank you for this review. I have seen this book around, and I was very curious about it. I think it might be the octopus on the cover…it looks fun. Jennifer – The cover *is* gorgeous, isn’t it? And it’s also representative of two of my favorite stories in the whole book. I hope you get a chance to read this one! SaraO – Thank you! This collection completely took me by surprise, and I hope you get a chance to read it as well. I just read The Girl in the Storm on the author website. AWW!! I struggle to find a connection to short stories but these sound beautiful in their simplicity.